Normally you can expect questions on circular motion and rotation in the free response category and/or multiple choice category in the AP Physics Examination. The essential points to be remembered in circular motion and rotation were discussed in the post dated 20th January 2008. A free response question and a few multiple choice questions in this section were discussed afterwards. You can access all those posts by clicking on the label ‘rotation’ or ‘circular motion’ below this post. 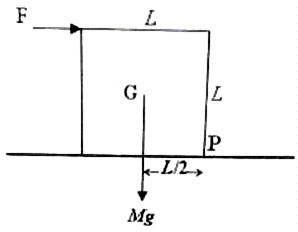 (1) A cubical wooden block of side L and mass M is placed on a rough horizontal surface. 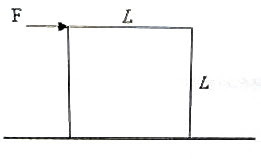 The friction between the block and the surface is sufficient so that the block can be toppled without sliding by applying a horizontal force on the block as shown in the adjoining figure. What is the minimum force F required for toppling the block? (2) In uniform circular motion of a particle which one among the following does not remain constant? The momentum of the particle changes because of the change in its direction. [option (d)]. (This question is meant for AP Physics C aspirants. But AP Physics B aspirants too will ‘enjoy’ it). 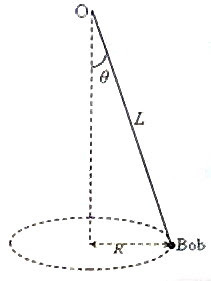 (i) The weight Mg of the bob acting vertically downwards. (ii) The centrifugal force MRω2 acting radially outwards. (iii) The tension T in the string. Since the moment of inertia of a thin ring about the central axis passing perpendicular to the plane of the ring is MR2, its moment of inertia about any diameter is MR2/2. (This follows from the perpendicular axes theorem). The moment of inertia about an axis passing through the edge and parallel to the plane of the ring (as obtained by applying the parallel axis theorem) is MR2/2 + MR2 = 3MR2/2. You will find a few more multiple choice questions (with solution) in this section here.